The mechanism by which hydrogen sulphide is released as gas in interstellar molecular clouds is described by scientists in Japan and Germany, in the journal Nature Astronomy. The process, known as chemical desorption, is more efficient than previously believed, and this has implications for our understanding of star formation in molecular clouds. Molecular clouds are rare, but are important parts of the galaxy where molecules form and evolve. In the colder, denser areas, and under the right conditions, stars are formed. 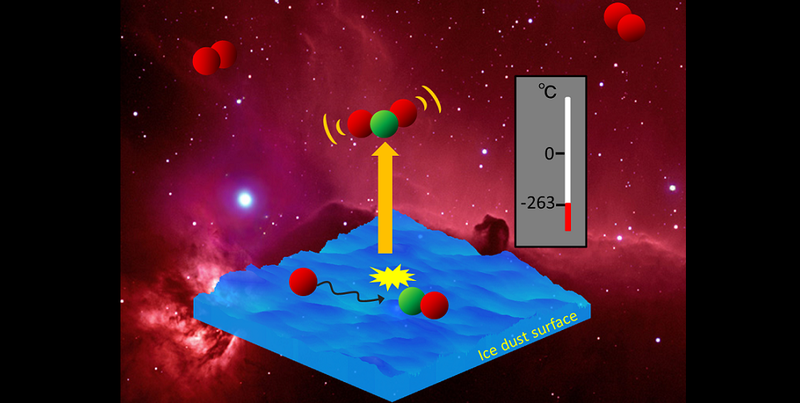 Theoretically, in molecular clouds at temperatures of 10 Kelvin, all molecules except hydrogen and helium should be locked into ice on the surface of dust, not freely floating around. However, observations have shown this is not the case. Understanding how molecules are released from dust at low temperatures is crucial to explaining how chemicals evolve in such cold clouds. The dissolution of particles from ice due to ultraviolet radiation, a process called photodesorption, has been demonstrated to play a role in some parts of the massive clouds. However, this would be inefficient in the darker, denser areas where stars are formed. Researchers have supposed chemical desorption is at work in those areas, releasing particles using excess energy from a chemical reaction. The idea was first proposed 50 years ago, but scientists had not provided proof of the process until now. The research team led by Yasuhiro Oba and Naoki Watanabe from Hokkaido University in Japan, in collaboration with the University of Stuttgart in Germany, set up the conditions to investigate. Using an experimental system containing amorphous solid water at 10 Kelvin and hydrogen sulphide (H2S), the team exposed the H2S to hydrogen and monitored the reaction with infrared absorption spectroscopy. The experiment demonstrated that the desorption is caused by hydrogen interacting with H2S and the reaction is therefore a chemical one. They were able to quantify desorption after the reaction, and found it was a much more efficient process than previously estimated. This work is the first infrared in-situ measurement of chemical desorption, and gives detailed descriptions during reactions which are key to understanding interstellar sulphur chemistry. “Interstellar chemistry is of great importance to understanding the formation of stars, as well as water, methanol and possibly to more complex molecular species,” says Watanabe. A significant step forward in the fields of astronomy and chemistry, the experimental setup can now be used to examine other molecules in the future.